For those Filipino nurses seeking to renew their Professional Regulation Commission identification card, be prepared to have 45 units of Continuing Professional Development programs. 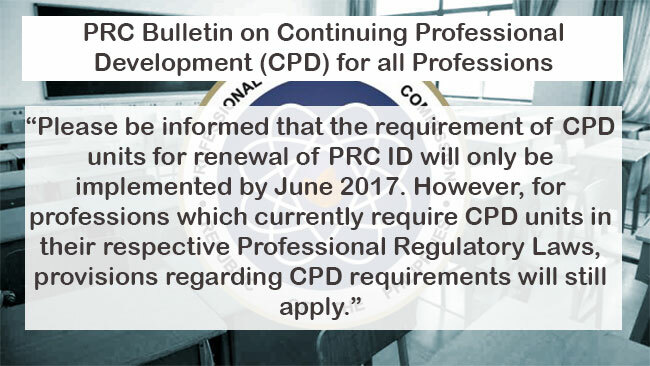 According to the guidelines included, all registered and licensed professionals shall complete the required CPD units every three years. The said law was sponsored by Senator Antonio Trillanes in the senate, but was neither signed or vetoed by former President Benigno Aquino III and lapsed into law last July 21, 2016. PRC said it will fully implement the said requirements on the first quarter of 2017 to give time for the Board to prepare existing rules and guidelines. To earn CPD units, PRC accredited some programs in the form of Professional Track. This could be seminars, training or workshops. There is also Academic Track such as master’s or doctorate degrees, professional chair appointment, residency, internship, specialty/sub-specialty programs, fellowship grants, and post-graduate diploma. Self-Directed Training is offered by non-accredited CPD providers evaluated by CPD Councils; or other such activities recommended by CPD Councils and approved by the Board and the Commission.